There are few decisions as nerve-wracking as buying your first home. Even if the bank gives you the green light, it’s easy to worry about the financial side of the big move. But a brand new incentive from Wycliffe Homes will help first-timers feel much better about taking the plunge into property ownership. Would-be buyers considering a home in Fairground Lofts in Old Woodbridge Village in Vaughan will be happy to hear that a townhouse in the community is well within their reach. 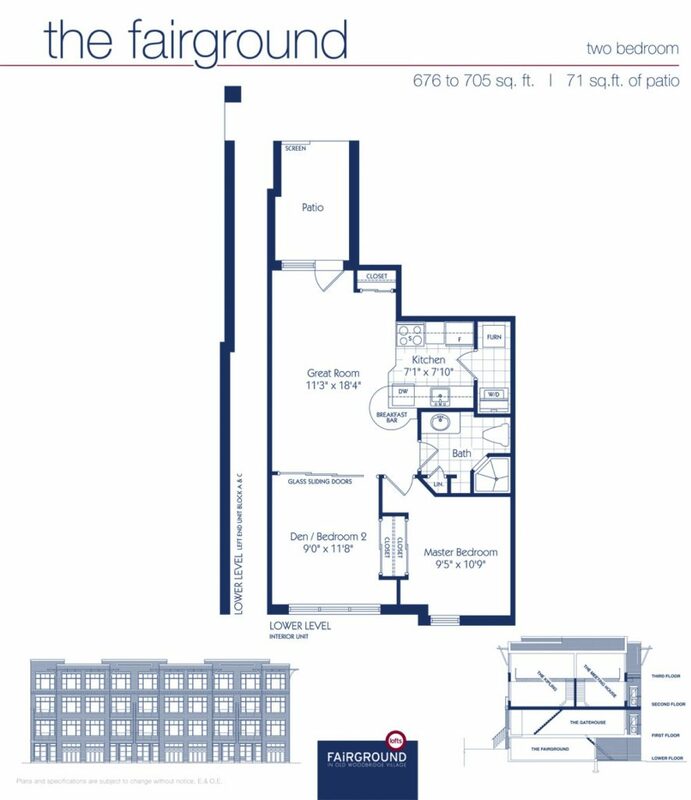 Open concept, two-bedroom suites, such as the “Fairground” elevation (layout below), are currently priced from just $294,900. And if you act fast, you can get $15,000 cashback, plus $5,000 toward furnishings from Suite 22 Interiors, a prestigious retailer of Italian-made products. Forget what you’ve heard about starter homes being modest. The “Fairground” option is stylish and smartly designed, making the most of its available 676 to 705-square feet. There’s plenty of natural light from the generous windows and the great room includes a three-panel frosted glass sliding track door that can be closed to create a private den or guest bedroom. The design also features a private private just off the great room too. And there’s no need to worry about storage. With extra stowaway pace in the den, master bedroom, great room and laundry room closets, everything in your home will have its own space. Wycliffe’s value-packed standards also features a number of helpful features including granite kitchen countertops with an under-mount stainless steel sink, five-paneled recessed shaker swing doors to the laundry room, and a stacking washer and dryer. Plus, Wycliffe is a made-to-measure builder, meaning purchasers can customize their space wherever possible. Located at Kipling Avenue near major highways and Go Transit, Fairground Lofts will be a quick commute to downtown Toronto once the new subway stop is completed. Suites range from 676 to 1,349-square feet and are priced from the high $200,000s. Occupancy is slated for Winter 2014.